"Where is the safety on this thing?" That's the last thing I heard Rick say before finding myself flat on my back on the floor, amazed that I couldn't feel anything below my waist or move my legs. Two teenagers, a .22 pistol, an acute attack of stupidity, and there I was, gimp for life. Technically, the diagnosis was a severed spinal cord at the 10th thoracic vertebra, but the simple translation was still gimp for life. How is this tearjerker tale even remotely related to nature photography? Well, to begin with, the sympathy money that came with the get-well cards allowed me to buy my first camera, a Mamiya/Sekor DTL 1000. I didn't have a clue about how to take bird photographs, but I knew it was something I wanted to try. I quickly progressed from the then standard 55mm lens to my first big telephoto rig - a Vivitar 135/2.8 and a Soligor 3x teleconverter. It probably bears repeating that that I didn't have a clue about how to take bird photographs. Nonetheless, when I began to get processed slides back with recognizable bird images on them, I was elated. Fortunately, sharpness, contrast, composition, exposure, and all those other criteria by which nature photographs are traditionally judged didn't mean much to me at the time. I kept plugging at it, thinking I was quite an accomplished photographer. Eventually I slightly upgraded to a 300/4 Miida (anybody remember that brand?) lens and a 2x teleconverter, then to a Spiratone 400/5.6 preset, and then to a Sigma 500/8 mirror lens, and so on. Need I mention that I still don’t have a lot of slides that I took with those lenses, even though I have ridiculously low standards for keeping slides? The most important connection between that long-ago incident and nature photography is this - the pursuit of wildlife images gave me a limitless goal and passion that persists today, and if I'm fortunate, will continue to possess and drive me for another 25+ years. The combination of a lifelong fascination with all aspects of natural history, a collector's (and loner's) mentality, and a love of technically excellent nature images, provides me with an unbounded and constantly shifting target to pursue. Forget that artsy stuff - all it takes to please me are sharp, properly exposed, well-composed images of whatever biological entity I happen to be fascinated with at the moment. Birds, insects, wildflowers, habitats...it doesn't really matter as long as I'm out in the field taking pictures. I'm not sure I buy into that old myth of the shut-in cripple who refuses to participate in life (I've never met one), but such a course of (in) action was never a consideration. If I hadn't pursued nature photography as a therapy of sorts, some other interest would have undoubtedly captured my fancy. I can't imagine that it would have been as enjoyable or rewarding as photography though. 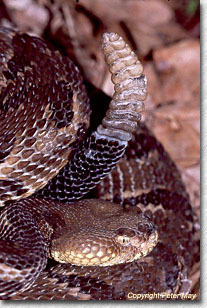 Wildlife photography is a physically and intellectually challenging activity. Success requires that you enter the organism's world: Find it, get close to it, and then if everything goes well, correctly perform all of the mechanical/technical steps that are required to produce a decent image. (I'm a manual kind of guy, so the number of correct steps is not trivial). Not surprising then, that even the best photographers find a significant proportion of their shots sailing into the trash can, and successes are such a source of pleasure. That first quick perusal of our slides on the light table is one of the most intensely enjoyable and, at times, crushing aspects of our craft. But I like to think that I get a bigger kick than most out of that first view of a decent shot that would have required one of you AB's (able-bodied, if you don't speak the lingo) only an instant to set up, but which took me 15 minutes of physical work just to get close to. Take my word, wheelchairs aren't designed for off-road use. One of my most vivid memories of nature photography occurred over 20 years ago when I noticed a gorgeous patch of cardinal flowers blooming in a roadside ditch. Getting down into the ditch was easy enough - it was getting back up the slick clay banks that was the problem. As the occasional car passed on that little-traveled Virginia back road, I'd duck behind cover to avoid being seen. I was going to by-God get out of that ditch on my own, and without having to sheepishly explain what I was doing there or why. About a half-hour later I did. The results were your standard, dark-background, over-flashed wildflower photographs (this was long before the days of TTL, balanced fill-flash, or even automatic exposure flash), but I still get a hoot out of looking at them every couple of years. So, if you see me in the ditch sometime, bring your camera and not your sympathy. When I’m out photographing nature, I’m pursuing my passion, just like you. 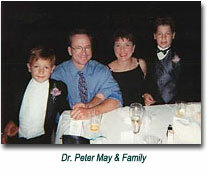 Dr. Peter May is a professor of biology at Stetson University in DeLand, Florida. An avid birder since his teenager years (before they were called "birders"), an entomologist/lepidopterist since about 1977 and a herpetologist since 1992, Dr. May resides in DeLand, Florida with his wife Deborah and their two sons, Sam and Benji. 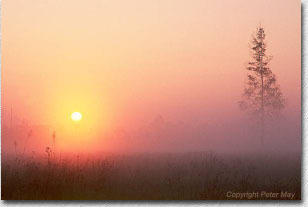 Learn more about Dr. May and view his excellent portfolio of nature and wildlife photography at his personal web site.